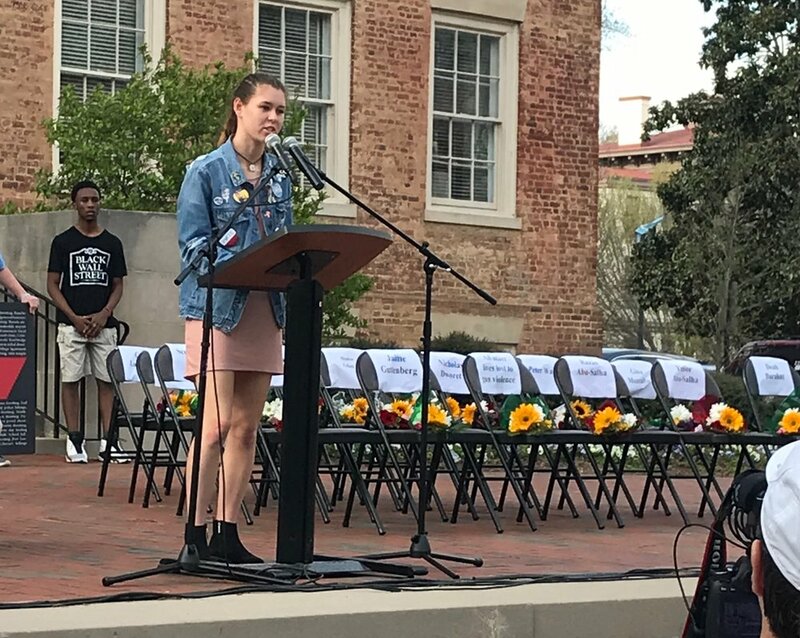 Ten years have passed since the last time I heard someone speak to the Carolina community from the steps of the South Building. Then-Chancellor Moeser somehow summoned the strength to inform students and faculty gathered around that law enforcement made a positive identification of the person shot and killed the previous morning. It was Eve Carson, our Student Body President. While I cannot imagine the heartbreak she would feel knowing the reason that brought Sarah Chadwick and Jaclyn Corin to those same steps 10 years later, the solemn courage these high-school women continue to show in response to more horrific gun violence must make her proud beyond words looking down on the place she loved so much. There was something about their energy, an intimate and infectious spirit like Eve's, that brings so many to believe the tide is turning in the right direction. No one elects anyone to think and pray. Those are things done in private. It is reductive to the hallowed halls of this nation's great discourse to pretend there is a reasonable counterargument to their tragically simple message: no child should learn in fear of being shot to death in a civil society. Act now or resign. It shouldn't even require anyone to vote you out. Your time is up. Students throughout the country plan to stage various walkouts to protest having to learn in fear of being shot to death. At C.E. Jordan High School (Durham), hundreds of students left their classrooms in solidarity last Wednesday afternoon. A central component to their message is that stricter regulations on the purchase and possession of firearms could have prevented the adolescent bodies of their peers being riddled with bullets. The politically charged atmosphere of gun control galvanized conservative responses to these protests, including the dissemination of false claims that liberal-leaning groups paid students to feign grief before a national audience. A school board in Texas sent a letter to parents threatening to automatically suspend any student for 3 days who walks out of class in protest. To any student or parent in North Carolina who receives a similar notice from their school board: that is against the law in North Carolina, the Fifth Amendment, and it probably amounts to viewpoint discrimination as against the First Amendment. The reality is that a walkout is not free speech issue until school administrators make it one. It should just be treated as an unexcused absence. N.C.G.S. § 115C-390 leaves it up to individual school boards to develop discipline policies for absences. No matter what, though, N.C.G.S. § 115C-390.2(d) prohibits a school from suspending a student for more than 2 days for truancy or tardiness. More importantly, prior to any suspension for truancy or tardiness, the school must provide the individual student notice of the intent to suspend the student and an opportunity to defend against suspension. Each individual, therefore, should be analyzed differently from the next under its policy prior to calling for suspension. Many school boards across the state have similar policies in reliance on the guidance of the North Carolina School Boards Association, a group consisting of policy professionals and attorneys who craft model policies that comply with state and federal law. My point is this: if a school board in North Carolina prophylactically threatens to suspend students for walking out in protest, it will very likely deviate from its already established absence policy; and no matter what, it will deprive that student of due process rights to notice and an opportunity to defend against the suspension. Why is that important? A school’s deviation from ordinary absence policy transcends the realm of conduct-oriented discipline and enters into the realm of content-oriented discipline, and thus, it activates First Amendment protection. In addition, the deprivation of a student’s right to public education is a government-taking of an entitlement, so a policy that does not allow for a notice and opportunity to defend said deprivation also violates the Fifth Amendment. Please do not intimidate students who wish to voice their opinion on this matter of such grave public concern. The angels who arrived above us far too early last week deserve at least that much. If you do, sharp legal minds who’ve read the entire constitution, not just one-half of one amendment, will protect those students with a level of passion, vigor, and competence you can’t yet fathom. A group purporting to consist of UNC faculty members from the College of Arts and Sciences, the School of Medicine, the School of Public Health, and the School of Law sent a letter to Chancellor Folt over the weekend explaining that it intended to physically remove Silent Sam (for non-UNC people, Silent Sam is a statute of a soldier from the Civil War on campus) at midnight on Thursday if the University did not remove it before then. The Daily Tar Heel confirmed the identity of at least one professor in the group who also verified its existence. The group is called G17. In 2015, the North Carolina General Assembly enacted legislation making it illegal for state officials to remove, relocate, or alter historical monuments without first obtaining the permission of the N.C. Historical Commission. One such way to obtain permission is to show the commission that moving the statute is necessary to safely preserve it. One such way to show necessity is a credible threat from distinguished members of the community that absent action from the commission and state officials this distinguished group will take matters into their own hands. Cleverly, G17 carved out very technical legal path for the statute’s removal. In this scenario, the 2015 law would no longer hamstring a state official from moving the statute because events conspired to make it necessary for its preservation. G17 announced via Twitter (G17UNC) that Chancellor Folt will ask Governor Cooper to petition the N.C. Historical Commission to preserve the statute by relocating it. The group momentarily decided to stand down in light of that promise, but it vowed to re-engage in the event Chancellor Folt does not follow through with Governor Cooper, as it remains committed to faithfully following through with the overarching promise the University makes it all its members - to provide an inclusive and welcoming environment free from discrimination, harassment, and related misconduct. In more a sequitur than you might initially think, here is a cool song from Mandolin Orange called Wildfire. Is it legal to wear headphones while driving in North Carolina? Though delayed from its original release date in October 2016, Apple still advertises its much anticipated "Airpod" headphones for release before the end of 2016. The headphones are wireless and boast speakerphone capability in its signature 'pod' design with competitive sound quality and comfortability. Apple lists the headphones at a retail price of $169.00, a price well in excess of its current wired version, but one on par with, or cheaper than, many headphones in the Airpod's prospective class. In anticipation of their release, I felt it helpful to answer a question I often receive at the various dinner parties I'm invited to and attend (just kidding, I'm not that cool): Is it legal to wear headphones while driving?. In North Carolina, the short answer is that yes, it is legal to wear headphones while driving. Many states in the nation have laws that regulate a driver's ability to wear headphones while driving - and many more ban it outright. North Carolina is not one of them. The reasons for banning the headphones are obvious, chief among them is that they substantially interfere with a driver's ability to hear and respond to emergency sirens or other roadway emergencies that arise while driving. That is why in California it is legal to listen to music in headphones while driving as long as only one pod is in the driver's ear and the other ear is open to hear and respond to emergency situations. While no law in North Carolina specifically prohibits the use of headphones while driving, that does not mean drivers in the state can use them with impunity. For one thing, it should be noted that if any driver intends to travel beyond the jurisdiction of North Carolina, it may or may not be legal in the bordering state. (South Carolina - legal; Tennessee - legal; Georgia - illegal; Virginia - illegal). For another, and perhaps more salient thing, the effect of wearing headphones may cause a driver to violate already existing traffic laws in North Carolina. To extrapolate on the above-contemplated scenario, if a driver in North Carolina cannot hear emergency sirens, and fails to react according to specific statutory directions to allow an emergency vehicle to pass, that is against the law in North Carolina. N.C.G.S. § 20-157 sets forth as follows: Upon the approach of any law enforcement or fire department vehicle or public or private ambulance or rescue squad emergency service vehicle, or a vehicle operated by the Division of Marine Fisheries of the Department of Environmental Quality, or the Division of Parks and Recreation of the Department of Natural and Cultural Resources, or the North Carolina Forest Service of the Department of Agriculture and Consumer Services when traveling in response to a fire alarm or other emergency response purpose, giving warning signal by appropriate light and by audible bell, siren or exhaust whistle, audible under normal conditions from a distance not less than 1000 feet, the driver of every other vehicle shall immediately drive the same to a position as near as possible and parallel to the right-hand edge or curb, clear of any intersection of streets or highways, and shall stop and remain in such position unless otherwise directed by a law enforcement or traffic officer until the law enforcement or fire department vehicle, or the vehicle operated," by the state shall pass. [Emphasis Added]. A driver with headphones in runs a real risk of not being able to hear the emergency vehicle within 1,000 ft under normal auditory conditions, as the headphones would certainly move the condition from the realm of normal to abnormal. It puts a lot of faith in visual clues. Not only is a violation of the above-cited subsection a Class 2 Misdemeanor, it is also negligence per se, so apart from criminal culpability expected from its violation, it can also threaten to create significant civil liability should any injury happen as a result of the driver's failure to follow the statute's directions for oncoming emergency personnel. What if injury does happen as a result? Well, that makes it a Class 1 Misdemeanor. Serious injury or death? That's a felony. As is often the case in the law, the short answer is very rarely the complete one. While no law specifically prohibits the use of headphones while driving in North Carolina, their use can substantially interfere with a driver's ability to comply with already existing traffic laws the violation of which carry serious consequences. “I am very happy with the services I received from Attorney Hastings. This was my first time dealing with the legal system...my fears were put to rest when I found Mr. Hastings. He explained everything that was going to happen and was always responsive to my questions and concerns. He took the time to explain my options so I could weigh the pros and cons...He was a true professional at all times; he is very knowledgeable, up front, and knows his way around the court system..."
The content provided on our website is for informational purposes only. The materials included on this website are not intended as legal advice. Before you make any decision that may have legal implications, you should consult with a qualified legal professional for specific legal advice tailored to your situation. Any testimonials contained on this site are not intended to demonstrate a guarantee of outcome or result. The information on this site does not create an attorney-client relationship.